On Tuesday, the head of Britain’s Porton Down laboratory caused a stir when he admitted that his scientists had not identified the “precise source” of the Novichok nerve agent used to poison former Russian spy Sergei Skripal, and Skripal’s daughter Yulia, on 4 March. The comment will give succour to sceptics such as Tom Switzer, who last week argued on The Interpreter that “there is still no evidence – none – about the identity of the culprit”. In fact, there is less to this row than meets the eye. Had the UK traced the Novichok to a Russian laboratory, they would have said so earlier. Instead, the UK’s case is built on three other interlocking pieces of evidence. First is the use of a military-grade nerve agent, originally developed by Moscow. That, as the Porton Down chief emphasised, is “only within the capabilities of a state actor”. Second, and beyond Porton Down’s remit, is evidence based on secret intelligence that Russia has manufactured and stockpiled small quantities of Novichok within the past decade, and investigated its use for assassination. Third is the assessment, also informed by intelligence, that Russia has an active program of state-backed assassinations, views defectors as legitimate targets, and has passed laws to enable such action. All of this constitutes evidence, some of which can be confirmed by independent third parties, such as the Organisation for the Prohibition of Chemical Weapons (OPCW), at the UK’s invitation. (Regrettably, Russia itself has openly undermined the OPCW’s work in Syria, and has pre-emptively dismissed its work in Salisbury). Other elements, based on human sources or signals intelligence, cannot. But the unprecedented international rejoinder to Russia – the largest collective expulsion of intelligence officers in history – demonstrates the strength of British claims. EU diplomats noted that Britain’s briefings, “including much that is not in the public domain”, were “extremely convincing” on Russian responsibility. It is reported that the UK divulged “unprecedented levels of intelligence”. That is why 28 countries, or a remarkable 15% of UN member states – including neutral countries (Ireland), non-EU members (Albania), and those close to Russia (Hungary) – looked at the UK’s evidence and judged it compelling enough to justify action that would result in the loss of their own personnel in Moscow. That is also why Russia’s absurd effort to force a joint investigation slumped to defeat at the OPCW on Wednesday. Are we to suppose that these governments are all dupes, their various security services tricked by feeble evidence – “assertion and bombast”, as Switzer puts it – conjured up in London? The alternatives to Russian culpability also strain credulity. 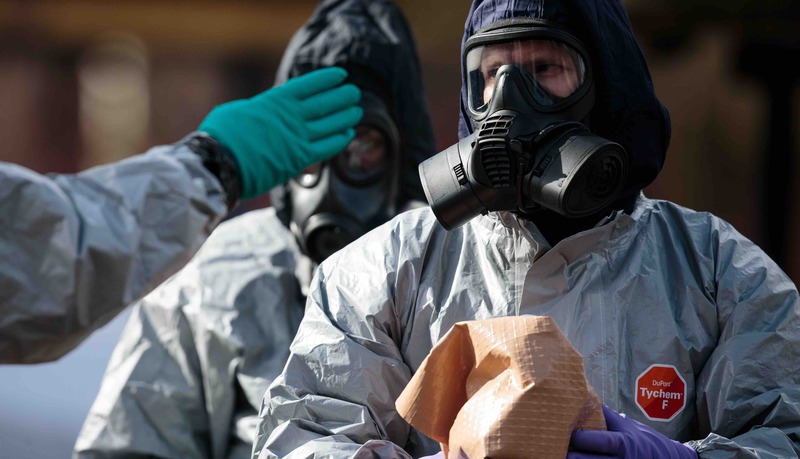 One of the Russian scientists who helped to develop Novichok has stated that any stockpiles held in the former Soviet Union would have “long since decomposed”, undercutting theories that rely on Uzbek or Ukrainian stocks. At the time of writing, Russia’s preferred conspiracy theory – chosen after running through a dozen or so others – is that the UK attacked its own citizen, and imperilled the lives of hundreds of others in Salisbury, as a “political provocation”. We are to believe that the British state was devious enough to conspire a false-flag chemical weapons attack, but forgot to instruct Porton Down on what line to take. a world of closed covenants secretly arrived at, of national business conducted behind the walls of all but impenetrable security, of skilfully planned deceptions, and so on. That is why estimative, or probabilistic language is used. When the British Government says Russian culpability is “highly likely”, this indicates more than 80% likelihood (see page 13 of the US Intelligence Community’s report on Russian election interference). Moreover, the British intelligence assessment process has been rigorously scrutinised and reformed in the fifteen years since 2003. Those who call for ironclad proof – often the same people who accepted, on a similar evidentiary standard, Israeli culpability for assassinating Iranian nuclear scientists, or America’s role in the Stuxnet cyber attack – are setting the bar artificially and unreasonably high. Such a threshold would allow adversaries to act with impunity, under a veneer of implausible deniability. Meanwhile, the question is whether the UK can keep up the pressure on Russia. The British Government will be dismayed that US President Donald Trump invited Russia’s Vladimir Putin to the White House in the midst of the crisis, and that Russia will be allowed to replace the expelled diplomats, rather than face the sort of personnel ceiling that would really constrain its spies. Russia has also doubled the size of its retaliatory expulsion of British staff in Moscow, looking to isolate the UK and test Britain’s resolve to escalate the matter. But the most important steps may be those taking place in the shadows, as intelligence agencies across the West enter a new era of coordination and collaboration against a Russian state which, as MI5 put it last year, is “operating to risk thresholds which are nothing like” those in the West. The film makes us think about the way in which civilisational differences can lead to new forms of artistic expression.